Lemon Lime Poke Cake is the perfect dessert! This cake is so easy to make, and pairs well with any meal, making it perfect for barbecues, picnics, or any upcoming gathering. The tangy flavors of lemon and lime combine with light and airy cake to result in a perfectly balanced flavor profile that is not too tart. And because it is filled with lemon pudding, this is one super moist and super creamy cake! Why Is It Called Poke Cake? Poke cake gets it name from the preparation process; the cake is poked with holes that are filled with a flavored liquid, which can vary depending on the particular recipe. These filled holes are what make poke cake a particularly moist and creamy dessert. Poke Cake was invented in 1969 by General Foods Corporation, as a way to increase sales of their flagship product, Jell-O. The original version is made by baking a white sheet cake, poking holes with a fork all over the top of the cake, and then pouring strawberry Jell-O all over the top of the cake, allowing it to fill the ‘poked’ holes. 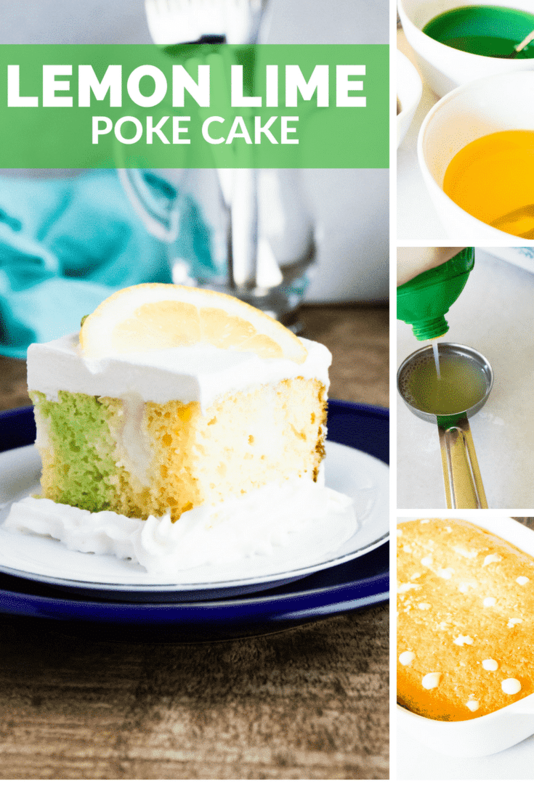 This Lemon Lime Poke Cake recipe calls for the cake to be infused with both lemon and lime gelatin. The cake is then poked again with larger holes that are then filled with lemon pudding. This double-poke method gives the cake a delightful trifecta of flavor that you will want to devour! 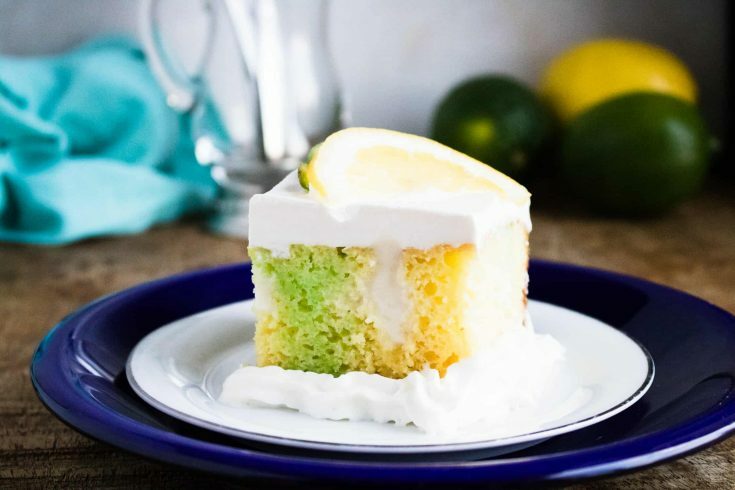 The finished cake is also covered with whipped topping and a sprinkling of lemon and lime zest, providing an additional layer of fresh sweetness. Step #3: Mix together the lime gelatin with 1 cup of boiling water until dissolved, and then spoon half of the gelatin carefully over the cake (reserve the other half), making sure to pour over the holes. Step #4: Mix together the lemon gelatin with 1 cup of boiling water until dissolved, and then spoon half of the gelatin carefully over the cake (reserve the other half), making sure to pour over the holes. Step #5: Mix together the lemon pudding with the milk until smooth. Poke larger holes in the cake with the end of a wooden spoon. Pour the pudding into the holes. Step #6: Top the cake with whipped topping and lemon and lime zest. Step #7: Chill for 4 hours before serving. Hummingbird Cake—deliciously rich cake bursting with bananas, pineapples, pecans, vanilla and cream cheese. Cannoli Cream Cake Roll—a rich and creamy take on the traditional Italian treat! Flourless Chocolate Cake with Dark Chocolate Ganache—chocolate cake with a layer of dark chocolate on top. So decadent and delectable! 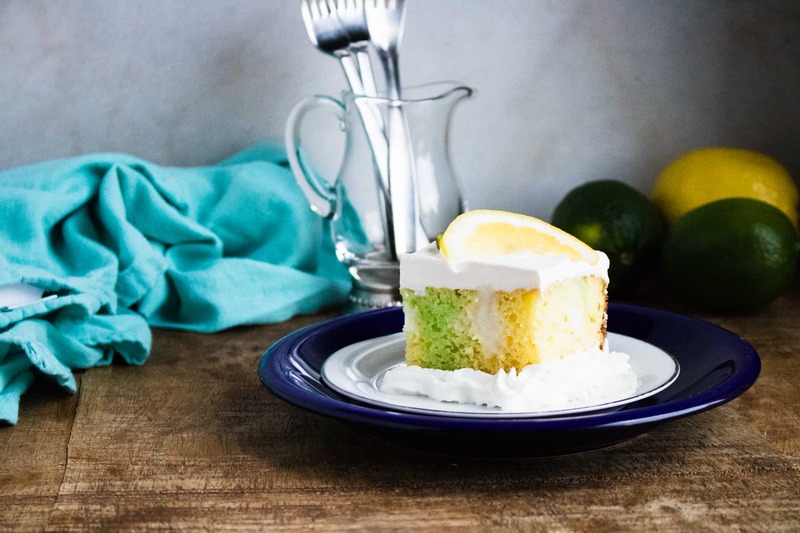 Lemon Lime Poke Cake puts a zesty citrus spin on the classic recipe. Mix together the lime gelatin with 1 cup of boiling water until dissolved, and then spoon half of the gelatin carefully over the cake (reserve the other half), making sure to pour over the holes. 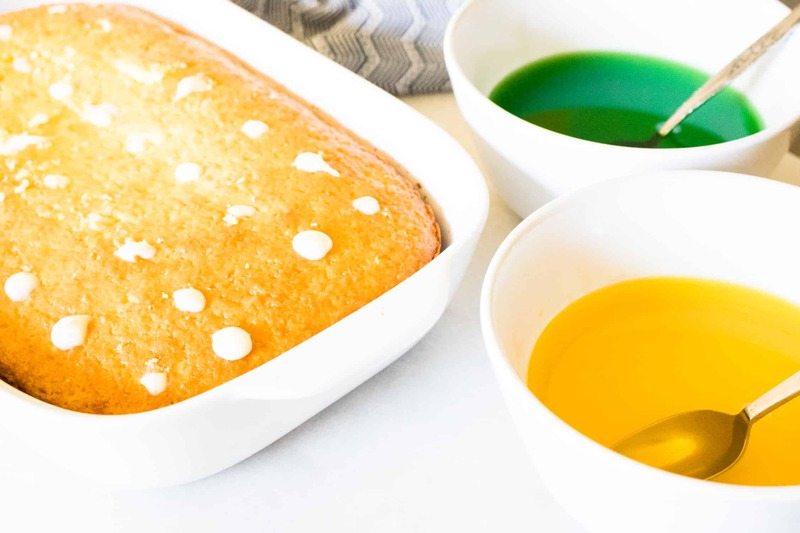 Mix together the lemon gelatin with 1 cup of boiling water until dissolved, and then spoon half of the gelatin carefully over the cake (reserve the other half), making sure to pour over the holes. Mix together the lemon pudding with the milk until smooth. Poke large holes in the cake with the end of a wooden spoon. Pour the pudding into the holes. Top the cake with whipped topping and lemon and lime zest.